MOCAP Round Vinyl Plastic Caps offer an attractive, quality finished appearance to consumer and industrial products. These plastic caps also provide inexpensive but tough protection to your valuable product line. Our vinyl caps are often referred to as a rubber cap because of their flexibility and pliable feel. Use Vinyl Plastic Caps as end caps, pipe caps, tube caps or for appearance finishing on your product. MOCAP round vinyl plastic caps can be produced in various lengths (up to 50.8mm long), wall thicknesses, hardness durometers and colours. The vinyl dip moulding process allows MOCAP to offer any of these options with no additional tooling charge. Round Plastic Caps are stocked in many sizes, ready for immediate shipment. 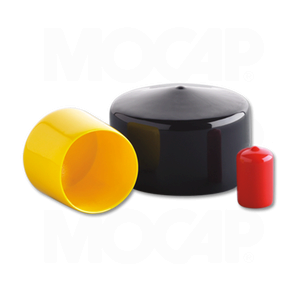 MOCAP can also manufacture vinyl plastic caps to-order with the fastest lead-times in the industry. Use MOCAP vinyl plastic caps as durable and inexpensive caps to protect your product threads or surfaces during assembly or shipping. Review all of MOCAP's Protective Products. MOCAP can dip mould round vinyl end caps in virtually any colour to compliment your product as a finishing cap visible to end users. Consider MOCAP's other Finishing and Appearance Products. MOCAP vinyl plastic caps are often used as inexpensive and disposable single-use masking caps for painting and coating processes under 100°C (212°F). For high temperature masking greater than 100°C (212°F), consider MOCAP's High Temperature Vinyl or EPDM Masking Products good to 149°C (300°F), or MOCAP Silicone Masking Products good to over 316°C (600°F). PMS or special colour matching available if our standard colour options do not meet your needs. MOCAP round vinyl plastic caps are available in sizes from 1.6mm to 214.0mm diameter. Many Sizes of Our Round Vinyl Plastic Caps are Stocked for Immediate Shipment.